Whenever possible, I prefer to make from scratch whatever my husband and I eat. We’re purists when it comes to food, because if the old saying “you are what you eat” is true, then the average American is the sum total of refined sugars, bleached flours, GMO’s chemicals and preservatives…basically a science experiment gone horribly awry. Food is one of the easiest things we can control to contribute to a healthier, happier life. While I won’t claim to be the most amazing chef in the world, I do find that often times food and drinks taste better and are much healthier when I get to make them myself. Most importantly, I know what goes into the recipe, so I also know what goes into my body. Convinced? I hope so! Now on to the recipe! Drain the almonds, and place in a blender with 3 3/4 – 5 cups of the filtered water, vanilla extract, and salt. → TIP: I use a Vitmix, which is SO WORTH THE MONEY! The higher the quality of your blender, the more water you can use and the creamier and smoother the almond milk will be. Pour the dates into the blender, and blend on high for 1 minute. → TIP: sear them in a pan to really caramelize and bring out the natural sugars, or microwave for about 10-15 second. This adds a delicious, natural sweetness to your milk. 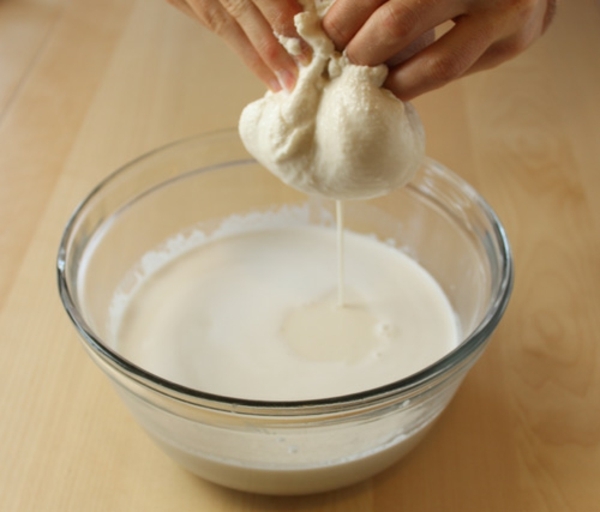 In the bowl you’ll pour the liquid into, place a strainer with the cheese cloth in it. This acts as a double filter. 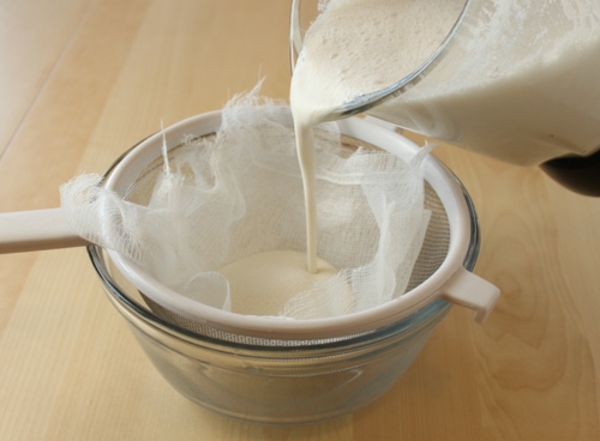 Carefully pour the almond milk mixture over the cheesecloth. After all the mix is poured into the strainer and cheese cloth, gather up the cheese cloth and wring out the remaining liquid. The strainer will catch any potential particles. CHOCOLATE: Add cacao powder and stevia for chocolate almond milk. MAPLE-VANILLA: Mix in maple syrup and vanilla beans to taste for a delicious Maple-Vanilla milk. SNICKERDOODLE: Add cinnamon, stevia to taste, 1/2 Teaspoon Vanilla Extract, 1/4 Teaspoon Butter Extract. My friends in the vegan/veggie community use the remaining nut puree for several recipes instead of throwing it out out. Toast it by baking it at around 375 degrees. That nut mix is a fabulous, paleo friendly + gluten free version of bread crumbs and also goes nicely over desserts, apple crisps, oatmeal, and yogurt (if dairy is your thing 🙂 You can also use it to make your own granola mix or protein bars. DIY Glowing Face Mask: don’t throw out that almond mush! Give yourself a facial that will leave your skin feeling GORGEOUS! Previous PostYoga Injuries: Now What?